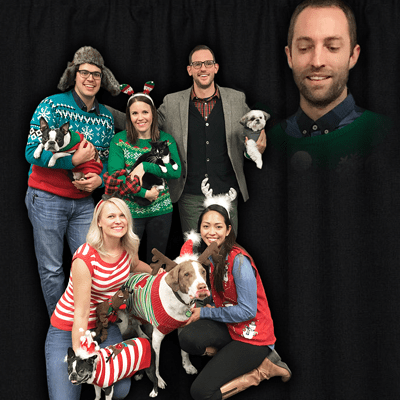 With the holidays in full swing, it’s always fun to include your furry family members in your annual holiday card. Follow these five tips below to make your pet holiday photo shoot and resulting holiday card a fun and stress-free experience for you and your pets. Have a questions about your pet’s behavior this holiday season? Learn more about our 24/7 Pet Helpline. You also don’t want your pet running away during a photo shoot, especially if they haven’t had their daily walk. Exercise and play with them before the photo shoot so they can burn off excess energy and remain calm during the photo shoot. Give them plenty of love and attention before and during the photo shoot so they feel relaxed and happy. Conduct a practice photo shoot so animals get used to the camera. Animals become distressed and anxious when they hear unfamiliar noises and find themselves in new situations. When using manual cameras, first point the camera away from your pet and then click the camera so they become familiar with the shutter noise. Keep plenty of treats on hand and give them a treat every time you snap a photo so they associate the camera noise with a positive experience. Instead of calling your pet by name, pet photographers recommend using a different noise or command to get your pet’s attention. Typically, if you call your pet by name they will come to you, which won’t work if you need them to stay in one spot. Whether you snap photos with your smartphone or a digital camera, professional photographers do not recommend using a flash or you will get that dreaded red glare in your pet’s eyes and the photos won’t look good. To avoid red eye and glare, the ideal location for a pet photo shoot is outdoors in natural light. A bright flash can also frighten animals and they might run away and hide from you and the camera. The cutest pet photos are fun candid shots that show cats and dogs in their natural surroundings – running, jumping, playing, and having fun. Pet photographers also recommend getting on the same level as your pet to capture their sweet faces and funny expressions. Don’t be afraid to get down on your hands and knees and shoot a variety of camera angles. By training and practicing with your pet as mentioned above, they will feel comfortable being in front of the camera. Include family members in your photo shoot and capture that sweet, loving bond you share with your pets. Add a little fun to your photo and have your pet wear some festive flare such as a sweater, jacket, scarf, a bow-tie, reindeer ears, or a Santa hat. 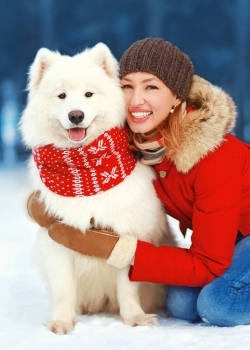 Or if you decide to do color-coordinated outfits for the photos, include your pet in that theme. By following the helpful tips above, you can make the holiday season extra special by including your beloved pets in this year’s holiday photo. Remember to have fun and your pet holiday photo is sure to turn out to be memorable! We know we had a blast creating ours and it will be something we never forget. If you want to see more cute pet photos visit the Pets Best Instagram.